You’ve seen it hundreds of times in art books. 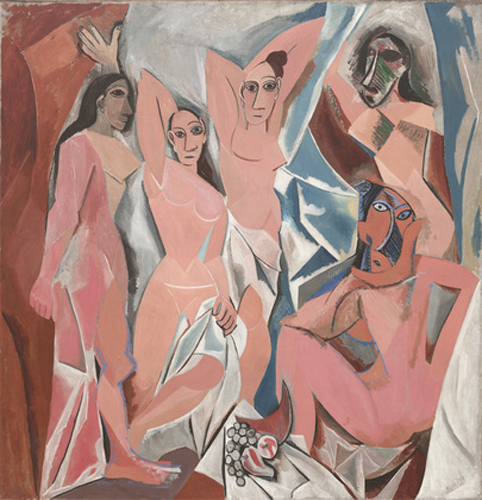 And now there it is: Picasso’s Les Demoiselles D’Avignon. 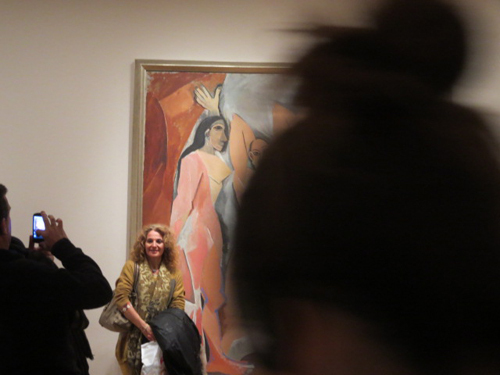 In the flesh, in the canvas, in the Museum of Modern Art in New York. This famous painting, this icon, yes, icon, of modernism. You’ve flown thousands of miles to get to New York, you’re modern, you’re not shocked by this shocking painting, you’re cultured, civilized, you’re familiar with its origin myths and the various interpretations offered by art historians. 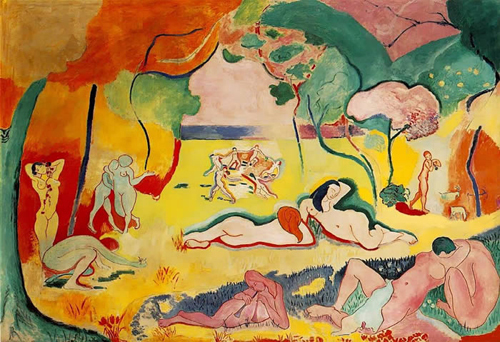 You know that Picasso’s early sketches show a medical student entering a brothel, that the red light district in Barcelona, where Picasso spent his teen age years, was along a street called Avignon. You’ve studied every passage of this painting from reproductions in art books: the course handling of the drapery, the aggressive fruit bowl, the terrifying masks. And here it is and here you are. It looks just like the reproductions in the books. It’s big and you knew that all along. There is no surprise, there’s nothing new here at all, nothing to learn, nothing to experience. So there’s nothing for you to do but stand in front of it like a good tourist and do the touristy thing; you ask your friend to take a picture of you standing in front of Picasso’s Les Desmoiselles D’Avignon. In 1936 in an essay called The Work of Art in the Age of Mechanical Reproduction Walter Benjamin said when people go to museums now, they don’t go to see art, they go to see the original of what they’ve seen before in reproductions. There’s no surprise, no experience, no epiphany, no shock, no aesthetic experience. What they’re curious to see is the original that spawned so many reproductions. 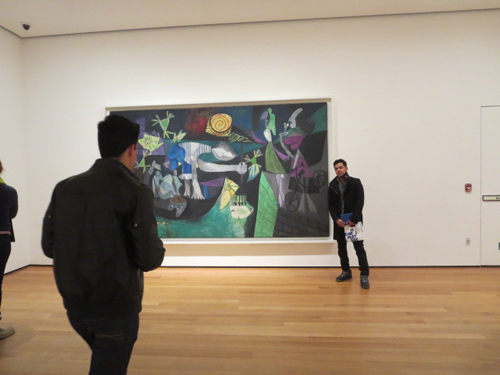 That’s what I witnessed earlier this month when I spent a day at the MoMA. 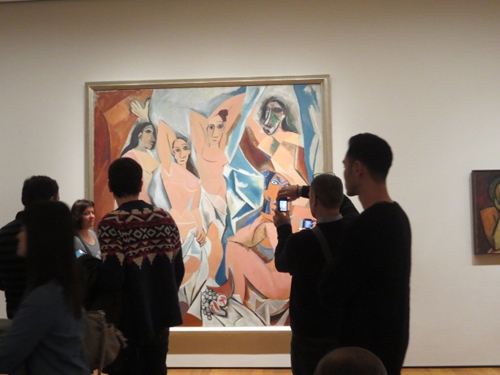 Les Demoiselles D’Avignon drew a crowd. I inched my way close to the painting’s edge and looked closely at the brush work. Very clean, very neat. No overpainting that would leave previous layers to peek through (pentimento). No reworking. No pencil or charcoal lines to lay out the composition. A less famous painting of Picasso’s, Night Fishing in Antibes, was not mobbed and attracted only the occasional poseur. 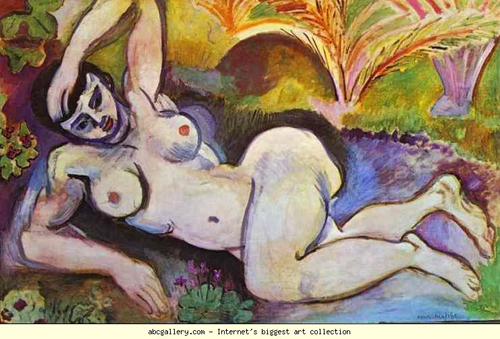 Famous because it was a Picasso, but not as widely reproduced. Hence a smaller crowd.